If you don't want any text on the back of the glasses, you can ignore this section. Adding text to the back of these glasses is $12.00 per set. 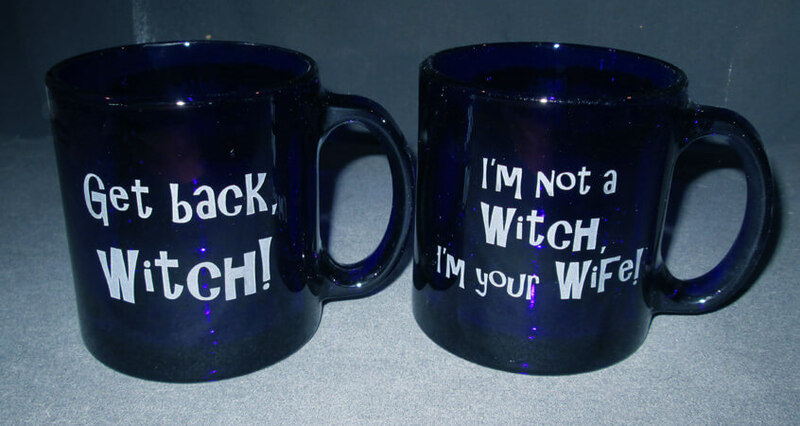 The Witch Quote 13oz Blue Coffee Mug Set contains 2 coffe mugs, one is engraved with the phrase"Get back witch!" and the other engraved with the phrase"I'm not a witch, I'm your wife!". The mugs can be further personalized on the back for a small additional fee.